Professors Raimund Ober and Sally Ward have been awarded £2.2m by Cancer Research UK. Scientists at the University of Southampton’s Centre for Cancer Immunology have been awarded £2.2million to develop the next generation of targeted therapy used to treat some cancers. Antibody-drug conjugates (ADCs) are a new form of treatment that can recognise and target just cancerous cells – and then make them kill themselves. 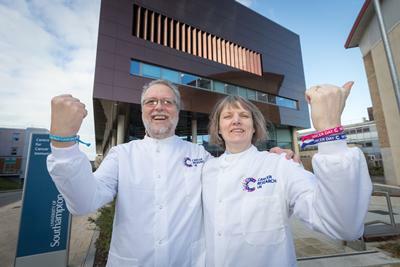 News of the grant, awarded by Cancer Research UK, which will fund this specialist immunotherapy research project over the next five years, has been revealed as people around the globe unite to mark #WorldCancerDay (Monday, 4 February). While the development of ADCs has been an exciting leap forward when it comes to cancer treatment - they currently feature in around 60 clinical trials for patients worldwide - the downside is dosage, as the drugs can be quite aggressive. In some cases, they have proved simply too toxic for patients, or have caused negative side effects and had to be withdrawn. However, the grant will support Professors Sally Ward and Raimund Ober, who recently joined the Southampton Centre from Texas AM University, in a new research programme that will find ways to better engineer ADCs. The study will also give a clearer understanding of how they are working in the body, enabling the team to develop new drugs which are less aggressive but just as effective in shrinking a tumour. Professor Ober said: “Science is becoming a very expensive business. Cancer Research UK has been responsible for a significant part of the funding we are receiving, and we are extremely grateful not only to the charity, but to each and every person who has donated money to fund research. The University of Southampton’s international reputation for translational research and the new Centre, were the major draws for Professors Ward and Ober when deciding to return to the UK. Professor Ward said: “The attraction of Southampton is that there is this whole team of scientists and clinicians working there, fully integrated in one centre, in a really impressive building. They have already recruited a number of key staff to work with them in Southampton on this and other key projects – and they hope to be fully up and running with a 15-18 strong lab group soon. The Centre for Cancer Immunology was funded through a £25m fundraising campaign by the University of Southampton, which hit its target on World Cancer Day 2018, six months ahead of schedule. to develop a new interdisciplinary innovation residency programme. Click here for more information about the Talent Fund and the Centre for Cancer Immunology.